Ventana Wildlife Society: Condor Blog: Happy Holidays from the flock! Follow the latest updates from VWS Biologists who lead the on-the-ground efforts to return the endangered California Condor to the wild. Happy Holidays from the flock! As 2015 comes to an end, our crew has been busy keeping track of the newest members of the flock – seven young captive-raised birds that now call the hills and coastline of San Simeon home. These youngsters have been rapidly gaining flying skills and attention since we began releasing them in September. For more details, check out this article published last week in the Cambrian. All of this year’s fledglings are thriving, including our mysterious untagged juvenile. 787, aka “Sky”, was spotted again last week at the release slope. This makes Sky the first of this year’s fledglings to make his or her big debut on the Big Sur social scene. Keep an eye out for Sky on the camera! 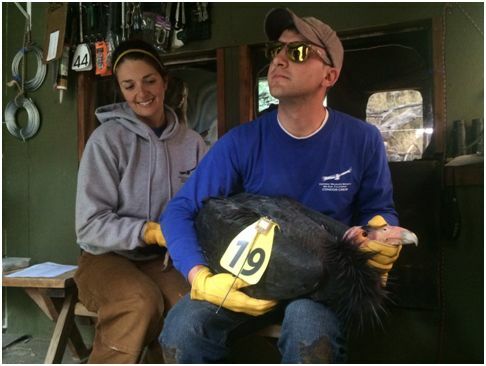 We also welcomed back several condors that had completed treatment for lead poisoning. Thanks to the skilled keepers at the Oakland and LA Zoos, they are fully recovered and have been released back into the wild. Here VWS Condor Interns Jane Sheffer and Darren Gross hold 219, aka “Puff Daddy”, as his transmitters are replaced before his release. This holiday season, we wish you all a very Merry Christmas, and hope that you are able to celebrate condor style, by chowing down while surrounded by family and friends. . Happy Holidays from the Condor Crew! Ventana Wildlife Society. Picture Window theme. Powered by Blogger.